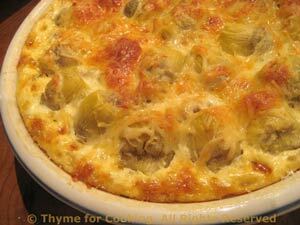 Sausage and Artichoke Quiche, Thyme for Cooking gourmet menus. I don't make pie crusts but we like quiches and tarts. 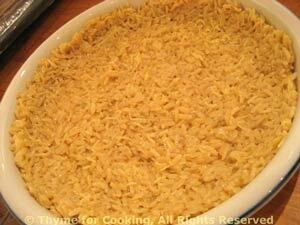 The solution is to make the crust with rice, or even pasta. A brown rice crust makes a much healthier alternative to a buttery short crust pastry... And, with the slightly nutty flavor, we like it better. You can use any rice you like. The variations on quiche are almost infinite. The sausage adds a lot of flavor - use any sausage you like, hot or sweet, squeezing it out of the casing to brown. Pre-cooking the rice makes it all come together quickly. Cook brown rice in stock according to package directions. Can be done ahead or even the night before. Pat into the quiche plate, working it up the sides as best you can. Bake in 375F (185C) oven for 10 minutes. Note: If you cook rice just before using, spread it on a plate to cool for 5 minutes before adding it to the egg. Heat oil in skillet over medium heat. Add onion, pepper and garlic and sauté 5 minutes. Add sausage and brown, breaking it up. If you are using whole sausages, either slice thinly or remove meat from casing. Drain artichokes and slice in half. When meat is done spread mixture evenly over rice. 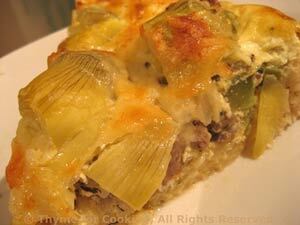 Arrange artichokes on top of meat. Whisk remaining 2 eggs well. Pour over all and bake for 45 minutes. Second note: My sausage meat is always quite dry. I have to add oil to brown it and there is no extra fat at the end of cooking. If yours puts off a lot of fat, drain it before putting in the quiche.